Renee Young introduces the kickoff panel and plugs WWE Network. She also introduces Tom Phillips as the host of the social media lounge. He will have New Day as his guests later on. Highlights of the history of the feud between Reigns and Rusev. Booker T is looking forward to the match, but he can’t pick Rusev or Reigns. Lawler thinks experience will make no difference. Lita thinks the cage is the perfect environment for Rusev and Reigns. Booker picks Reigns, Lawler and Lita pick Rusev. Bayley joins the panel, replacing Lawler. Bayley says tonight is about revenge. Dana Brooke made it personal, so she needs to take care of her before she proceeds to becoming the champ on RAW. Bayley wants to inspire everyone to follow their dreams. She’s also proud of Charlotte and Sasha for competing in Hell in a Cell tonight. A few clips are shown of the feud between Enzo & Cass and Gallows & Anderson. Lita picks Enzo and Cass, Lawler and Booker pick Gallows and Anderson in their tag match tonight. Kevin Owens and Jericho are best friends. Owens has retained the title with help. Seth Rollins is trying to drive a wedge between the best friends. Tonight, Owens and Rollins will be alone in Hell in a Cell. According to Jericho, it will be just another episode of the Kevin Owens Show. The panel is impressed by Rollins’ win over Jericho and Owens. Booker picks Owens, Lawler and Lita pick Rollins. Brian Kendrick approaches TJ Perkins and wonders about his request to let him win. Kendrick thinks it can be like old times, when Kendrick did everything he could for TJ. Perkins tells Kendrick he should go out there and win, Kendrick says Perkins should let him win. Rich Swann joins the panel, replacing Lita. Swann thinks Kendrick is disrespectful for what he’s doing. Booker questions Swann on his dancing. Renee insists on some music. Swann dances, Booker joins, then Renee tries but reminds Booker of Lawler’s heart attack. Good match. Sin Cara was highlighted in the match, but Drew Gulak and Cedric Alexander stood out as the best. This was a fun and exciting match. It was better than an opening match, and it felt like the cruiserweights wanted to take advantage of the time they were given. New Day reminds Tom that he should take care of his body. Woods is looking forward to all of the video games. New Day also does not divulge their strategy. Tom gets beat the hell up by New Day (verbally, not physically). Clips of Foley making Charlotte versus Sasha an important match (with clips of most, but not nearly all, of the women who have made an impact in women’s wrestling in WWE/WWF). Lita puts over the women’s Hell in a Cell. Booker T names the women’s match his Shucky Ducky Quack Quack moment of the night. Lawler thinks the women should think about what they’re doing. Booker and Lawler pick Charlotte, Lita picks Sasha. Yeah, it was a fine kickoff. 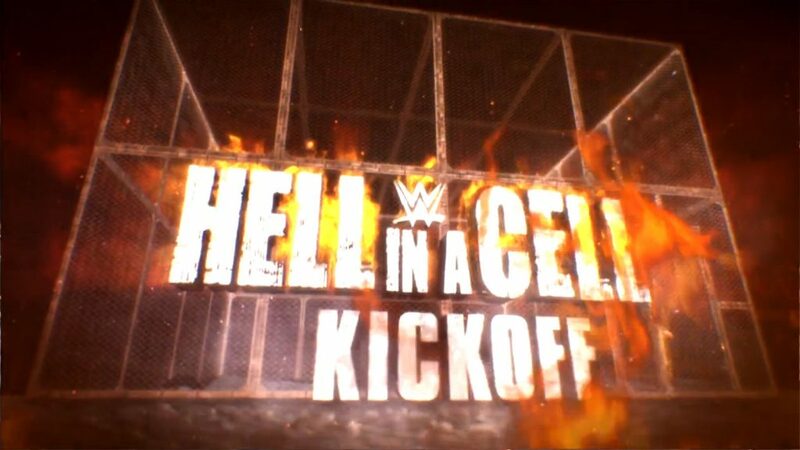 The match was really good for a kickoff, but the hour itself was filled with a lot of talk that only felt like filler. Because it was the only match, but it was also pretty dang good. A fine warmup for the show.